In true Groove Yard Stylee, we are very proud to bring you a continuation of our Bespoke Parties in one of The Perths best kept secrets - over looking the Indian ocean, with some very special guests. OLD SKOOL HOUSE, CLASSICS, ANTHEMS and all things GROOVY! WE ARE TALKING PROPER PARTY MUSIC FOR PEEPS THAT KNOW !!! As per all of our previous events, This WILL be a sell out event so don't delay in getting your tickets. As usual this is going to be another epic event, in one of Perth's most exclusive venues with top drawer production you have come to expect from our parties. Inbox us now to reserve your tickets online only, or for any questions, call the number below. Marshall Jefferson is one of the founding fathers of house music as it is known today. Marshall was a central figure in the development of the Chicago house scene and produced seminal house anthems including ‘Move Your Body’, ‘7 Ways To Jack’ and ‘Open Our Eyes’. He has worked with the best in the business, from fellow founding father Frankie Knuckles to Roy Davis Jr., Steve ‘Silk’ Hurley, Felix Da Housecat and Lil Louis. Marshall has had a leading hand in the growth of the acid and deep house movements and even today continues to evolve these genres amid dooms-dayers predicting their collective demise. Marshall’s first release, 1985’s ‘Go Wild Rhythm Trax’ on Virgo Records, demonstrated Marshall had the talent vital to succeed in such a fickle industry. ‘Move Your Body’, originally a production Marshall had passed onto Ron Hardy, was released on Trax Records in 1986 and is today recognised as a genre-defining release, having been subtitled and acclaimed ‘The House Music Anthem’. The mid-1980s gave way to the development of acid house, and Marshall actively participated in the movement’s growth through his use of the Roland TB303. The release in 1987 of ‘Acid Trax’ launched the career of DJ Pierre and Marshall went on to work with the likes of Ten City, Robert Owens, Keith Thompson and Pierre’s collective Phuture. Forever in search of fresh inspiration, Marshall switched his focus in the late 1980s from acid house to the then relatively new sub-genre of deep house. ‘Open Our Eyes’, released on Big Beat in 1988, was a huge success; nowhere before had a producer been able to make such an emotional connection with the listener and Through his work with vocalists like Kim Mazelle, Ce Ce Rogers and Curtis McClaine, Marshall produced hits on labels including Republic UK, Trax Records, Atlantic and Syncopate. 2004 saw Marshall team up with DJ Pierre once more to release ‘Clap Your Hands (Everybody Dance)’ on the UK’s Essence Records. 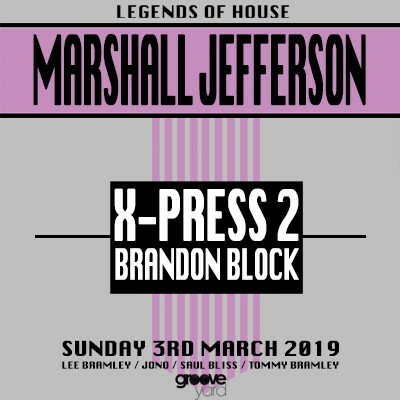 The following year Marshall appeared at Pacha as part of their ‘Fathers of House’ events, a series celebrating house music’s heroes from past and present. He is currently touring extensively, continuing to spread his love of music around the world. Such is their swashbuckling sense of adventure, it’s hard to believe that X-Press 2 have been at the vanguard of British electronic music for nearly three decades now. Whether it’s as musicians, DJs or remixers, the London duo share the same sense of musical discovery that first united them on the acid-house dance floors of Shoom and Spectrum and the Balearic playgrounds of Ibiza. A pioneering spirit that fuelled early Nineties underground anthems such as the percussive, US-influenced Muzik Express and London X Press. And why not? Chutzpah that helped them create languid deep house classics like Lazy and Give It with vocalists as unlikely – yet inspired – as David Byrne of Talking Heads and Kurt Wagner of Lambchop. Party man(iac), legend and one of the ‘old school’ of DJs there during the early days of house music, he has become somewhat of an elder statesman of the scene – been most places, done most things, and surviving to tell the tale. Brandon first made his name as part of the Flying Records soiree playing a Tuesday night session at Queens in Colnbrook. Like the other Flying DJs, Block soon began guesting nationwide on the embryonic club circuit. The next point for a young DJ at that time was Ibiza, a place that helped shape the reputation of Brandon in several ways when he then became the resident at the newly opened Space. With DJ partner Alex P they put some decks behind the bar of the Space chill-out area and called it ‘The Full Moon Terrace Bar’. The world-famous Space Terrace was born and the rest is history. Brandon began getting worldwide bookings, and soon became one of the headliners for most of the major house nights in and around the U.K with Residencies at Clockwork Orange, Up Yer Ronson, Ministry of Sound, Turnmills and Seb Fontaine's Malibu Stacey. It was in places like these that Brandon cemented his reputation as a global sensation.